The What-You-See-Is-What-You-Get, or WYSIWYG, rich text editor displays content in a representation of the formatting that will appear on the rendered page. Text can be formatted using the options in the toolbar. The paragraph format options can be used to change the formatting of selected blocks of text. 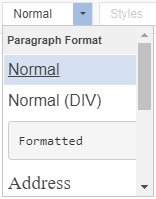 Normal The default format for text written in the editor is 'Normal'. 'Normal' text will be output on the rendered page as body text, using HTML <p> tags. Text placed within <div> tags, instead of <p> tags. Hyperlinks are formatted as underlined text by default. 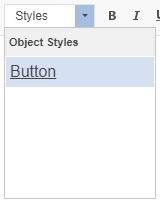 They can also be styled as a button (below) using the option in the Link style dropdown list. Font and paragraph styles can be applied using the options in the toolbar or shortcuts. Links and anchors can be created, edited and removed using the link options in the toolbar. Recommended for links to external URLs and email addresses. The Link modal opens. The Display Text field will contain the highlighted text. 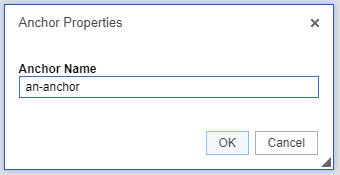 Paste the destination URL into the URL input field. The Protocol dropdown list will automatically select the correct option. Recommended for creating links to pages and files on the site. Anchors enable browsers to locate specific pieces of content. Anchors can be inserted into text using the Anchor option in the toolbar. An anchor flag will now be visible in the text editor. click the Unlink option. The link will revert to normal text. The Remove Format option in the toolbar removes font styling from selected text. To remove formatting from all text content in the WYSIWYG, first click the Select All option in the toolbar, then click Remove Format. When text content is copied from a webpage or document, the text styles and formatting of the source content are also copied to the clipboard. If Paste (Ctrl + V) is used transfer copied text, the source styles and formatting are transferred to the WYSIWYG text editor. When this happens, these styles take precendence over the site's font settings (Font Management). It is considered best practice to remove source styles from copied text when it is pasted into the text editor. The text content will be pasted into in the WYSIWYG text editor but all styling and HTML markup will be removed (i.e. all text will be formatted as Normal text). Images and files can be embedded on pages using the WYSIWYG text editor. Upload from Web: enter a URL to a file or media resource. Images and files will be copied to your site, embeded media will be embeded and pointed to on the source server. NB This method only supports the embedding of YouTube content. The images and files in the site's file store can be updated independently to the embedded image or file link items in the text editor. Content services which make media available for embedding in iframes typically provide URLs for embedding content within iframes. There is an iframe tool in the 'Full HTML' toolbar to embed iframes using these URLs into the text editor. Note: an embed URL is not the URL for the page the content is currently embedded on; the embed URL refers directly to the piece of content. Embed URLs must use https in order for the content to display on the page; see the Oxford Mosaic website for more information about https use on Mosaic. In the URL field, enter the URL for the content being embedded. Note: this is not the URL for the page the content is currently embedded on; the embed URL refers directly to the piece of content. Content providers which make media available for embedding in iframes typically provide embed URLs. Embed URLs must use https in order for the content to display on the page; see the Oxford Mosaic website for more information about https use on Mosaic. Click 'OK'. 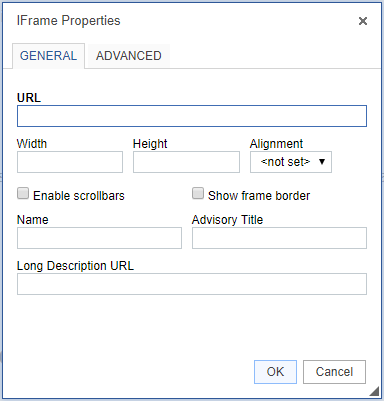 The iframe will be represented in the WYSIWYG editing view by a blank panel labelled 'IFRAME'. When the edits are saved, the embedded content will be visible when viewing the page. This method only applies to embedding YouTube content. Details are in the section on Inserting Images and Links to files. 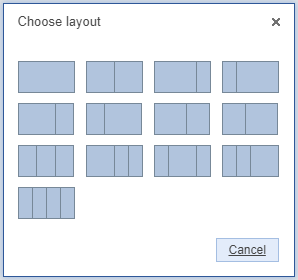 Multi-column layouts can be inserted into the WYSIWYG editor. All content that can be inserted into the text editor can be displayed within a column. Column layouts utilise the Bootstrap Grid system, which ensures the columns behave responsively at different screen widths. See WYSIWYG examples in the Mosaic Pattern Book for more information. The toolbar can exist in four different configurations, ranging from all editing tools being visible to a restricted number of editing tools; and a plain text version of the editor with no toolbar. The toolbar configuration that is visible to a user depends on the HTML settings of the WYSIWYG. All editing tools are available to the user. 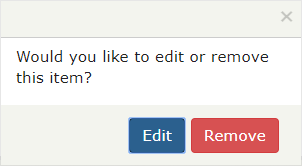 A subset of the editing tools is available to the user. A number of options are not displayed to the user, including the HTML source view. The listing item text setting provides the editing options available to users in some of the content editing text input areas, for example, the lising text input and banner text input fields. Plain text formatting removes the toolbar and provides the option of inputting HTML as plain text. *SSO profile editors are unable to edit WYSIWYGs whose HTML settings have been set to 'Full HTML' or 'Plain text'. A Site Owner or Site Administrator will need to edit the SSO editor's profile page to change the WYSIWYG HTML settings to 'Filtered HTML' or 'Listing item text' before the SSO editor can edit text in the WYSIWYGs on their page.